Although this begins with an apparent Chupacabra report, what comes out of it is an expose on multiple reports that plausibly stem from possible pterodactyl sightings. I knew about such sightings in New Guinea and having such sightings appear in the four corners region is a surprise. 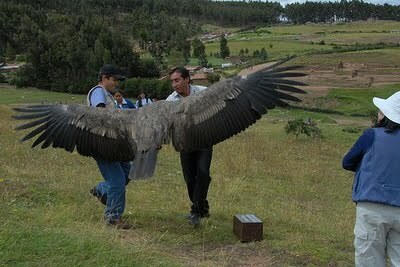 1 The creature’s wing span reaches an apparent twenty feet which is easily twice that of the condor. 2 We know that a pterodactyl had a membrane wing system. What was not known was that it was feathered and possibly extended in area by these feathers. 3 Thus the pterodactyl does look like a cartoon version of a giant Roc up to and including the bald head. The eyewitness report picks up a whip like tail that is proof of been not quite a bird. 4 There is obviously few of them but surely can range globally as indicated. 5 They live in mountain country and possibly were it is mostly arid. 6 They must be nocturnal or we would have ample sightings. 7 The bald head makes them natural scavengers. 8 I do not see them as blood suckers and we can leave that to the giant vampire bats who share similar niches. 9 They are superb gliders who naturally frequent mountain tops to catch updrafts. We have a number of convincing reports and no hard data as yet. The natural human assumption has been that flying animals need daylight and that turns out to be a stupid assumption. Large eyes are sufficient to provide useful vision and keep the creature away from the broiling heat of the day. The game is also about during those hours. According to my friend J.C. Johnson of Crypto Four Corners, in March 2010, 24 sheep were mutilated at a farm near Hogback, New Mexico, on the Dine' Navajo Reservation. The livestock owner explains that there were large talon marks but very little blood and no evisceration. Was this an attack by a large flying predator? Why were the carcasses left intact? Could this have been a Chupacabras? Was this another example of animal mutilation and experimentation by non-terrestrials, aliens or government entities? J.C. mentioned that a large cryptid bird or pterosaur may have been responsible for this act. That theory is not as far-fetched as it may initially sound. For many generations, people in New Mexico and parts of Texas say they've seen birds so big they seem prehistoric. One man claims the rugged landscape near Las Cruces hides a mystery that's haunted him for several years. Dave Zander has lived near the Doña Ana Mountains for more than 30 years spending almost all his spare time hiking, exploring and fossil hunting in the range between the Robledo and Organ mountains. He saw something that he's unable to explain and many people find hard to believe. He recalls the day eleven years ago when he spotted something extraordinary: two creatures perched on a mountain less than a mile away. Definitely something out of the ordinary. "Not a normal bird, definitely of a giant variety," Zander continued. "It makes you feel like it could come over and carry you off if it wanted to." Zander witness a real-life scene out of the movie Jurassic Park? One ancient bird in the vicinity is an Andean condor living at the Rio Grande Zoo in Albuquerque. But it's wingspan of 12 feet pales to what Zander described: birds with an unprecedented twenty-foot wingspan, with pink bald heads and all-black bodies, and feathers on their enormous wings. There is nothing on modern record like it. "In comparison a 20 foot wingspan would truly be a monster and something undocumented by science," cryptozoologist Ken Gerhard said. "I believe what Dave Zander may have seen are surviving teratorns." Gerhard has made a career studying prehistoric birds. "What's interesting the reports of these giant raptor-like birds to continue into modern times," he said. "We seem to have a large concentration of them here in the Southwest particularly in the Rio Grande Valley of Texas as well as New Mexico and parts of Arizona." Gerhard documented many of these strange reports from all over the globe in the book "Big birds! Modern sightings of flying monsters." The book includes sightings in different clusters over the past 30 years. In 1972 in Maxwell in northeastern New Mexico, Ronald Monteleone of Trinidad, Colo., reported what he thought was a pterodactyl flying out of an arroyo. In Lordsburg in the 1800s locals talked constantly about the sightings of pterosaurs. And a picture circulated the country in 1890 out of Tombstone, Ariz., but it's never been considered totally legitimate. "Other eyewitnesses are describing specifically giant feathered dark birds with an enormous wing span," Gerhard said. Gerhard said his research falls into two different descriptions from witnesses. Some said the birds look like the prehistoric pterodactyl while others, like the creatures described by Zander, resemble the ancient thunderbird from Native American mythology. You can find thunderbird images atop many totem poles and also carved into the lava rocks of the Petroglyph National Monument in Albuquerque. Similar images are found in petroglyphs all over North America. According to legend, the thunderbird is said to have a wingspan the length of two canoes with the ability to deafen people with the sound of its flapping wings. "It is definitely a real animal, according to the native peoples that lived here," Gerhard said. "It's not necessarily a legendary animal." However a word of caution comes from folks like Ben Radford, managing editor of the Skeptical Inquirer magazine, which applies scientific reason and evidence to extraordinary claims. "There is a desire to link modern sightings with these Native American stories but the problem is they're not necessarily the same thing," Radford said. "Ultimately a lot of these sightings, whether it's these monsters, these creatures, Chupacabras, what have you, these come down to eyewitness testimony," Radford said. "They're stories, there's nothing wrong with stories, but they're just not good evidence." 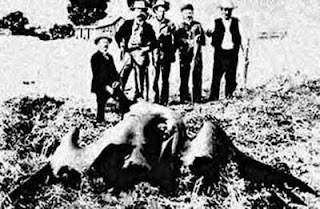 Radford has debunked numerous stories about the Loch Ness monster, crop circles and Bigfoot. He said he relies on evidence. "You don't have bones, teeth," he continued. "You don't have any hard evidence, so you look to these stories, you look to these myths. "We know from many scientific experiments people are notoriously unreliable about estimating things." And in this case, Radford said he thinks Zander and the other witnesses in Texas overestimated the birds' size. "I believe there's a good chance that a number of large prehistoric animals remain undiscovered by modern science." Gerhard said. "Do I think there are giant animals and birds and creatures out there?" he said. "No." For his part, Zander continues to keep his eyes on the skies but hasn't had a repeat visit from the creatures. The one experience has stayed with him. "I feel honored to have seen the one sighting," he said. "I had if they're still up there still living up there and thriving, I say awesome, more power to them." Dear Sir. I witnessed a large flying creature this evening that I cannot identify. I found your site during a search. I'm apprehensive of mentioning it to any friends or family until I can get a grip on what this was. I live west of San Antonio, TX near Medina Lake. Today, I was on a random outing to the area near the Diversion Lake dam. At about 7:30 pm, I was on my way back up the trail when I suddenly heard a loud awful scream coming from below the dam downstream. It sounded like an owl but lasted longer and was much louder. I stopped walking and watched downstream to see if I could catch a look at what caused the sound. I then noticed a large flock of birds flush out of the trees near the riverbank. Then suddenly this giant flying creature swooped down into the river valley and just as quickly flew back up into the rocks. I continued to watch but did not hear or see it again. I call it a creature because it looked nothing like a bird. I was about 50 yards from it and would say conservatively that it's wing span was 15 ft. or so! It was dark colored and had a very long beak and a strange long thin tail. This sounds crazy, but it actually resembled one of those flying dinosaurs though the head was not as large and it looked like it had feathers. For generations, the mystery lights of Marfa, Texas, have entertained residents with their strange dancing. On some warmer nights, a ball of light seems to split into two, which will separate and fly away from each other before turning around and flying back together. They have recently been linked to flying lights in the southwest Pacific, lights that natives of Papua New Guinea testify are from large flying creatures. In southwest Texas, local residents have speculated about dancing devils or ghosts. Scientists have preferred something along the lines of ball lightning or earthlights, but all their scientific explanations have tripped over the resemblances to line dancing. If atmospheric energies or tectonic stresses cause the displays, why do two lights horizontally separate for a long distance before coming back together? Now a cryptozoologist from California has explained the dancing lights of Marfa. Tales of spooks may hold a spark of truth, for recent research implies intelligence directs the lights: Bioluminescent flying predators may be hunting at night and catching a few unlucky Big Brown Bats: Eptesicus fuscus. According to Jonathan Whitcomb, a cryptozoology author in Long Beach, California, when one of the bioluminescent predators has been glowing for awhile, not far above the ground, it will be joined by another of its kind, which will then turn on its own glow. After insects have been attracted to that area, the two creatures will separate, which appears to distant human observers to be one light splitting into two. The predators will fly away from each other for some distance, then turn back and fly together. During the separation, bats may begin feeding on the concentration of insects before being caught from two sides by the larger predators. Whitcomb was a forensic videographer, in 2004, when he traveled to Papua New Guinea, hoping to videotape the glowing nocturnal "ropen," said to be a large flying predator and scavenger. Although he did not see the creature, he interviewed many natives, who impressed him with their credibility and amazed him with what they had seen. Whitcomb became convinced that the ropen is a pterosaur, commonly called by Americans "pterodactyl" or "flying dinosaur." After returning to the United States, he wrote many web pages about the concept of modern living pterosaurs in the southwest Pacific. He was surprised at the response: emails and phone calls from eyewitnesses of apparent pterosaurs in the United States. He analyzed the eyewitness accounts of those flying creatures and wrote a nonfiction book: "Live Pterosaurs in America." The second edition of that cryptozoology book has just been published (ISBN-13: 9781456341350). Where Have the Giants Gone?